This is a quick hit for today, but one of the most worthwhile posts if you are looking to save money on an upcoming vacation. This is in no way a promotion, no way a shameless gimmick, and we are in no way benefiting from this. The simple fact is that Yapta.com can potentially save you a ton of money on your next vacation, and have you sipping pina coladas with all the leftover cash you bank. When you book a vacation this summer, or anytime for that matter, you should immediately hop online and register your airline confirmation with Yapta. It will instantly and automatically track your ticket and the price that you paid and notify you if the price drops at any time. If, and when, the price of your ticket drops in price all you need to do is call the airline, notify them that you are aware of the price drop, and you will be given a refund for the difference. Better yet, if you are feeling crunched for time, or just do not want to deal with the airline, Yapta will call them for you for a fee of $15. Sounds too good to be true, right? Thousands of sites online promise to save you money and cut costs for traveling but cannot deliver. There are an infinite amount of blatant self promotions and sites that are really just in it for a quick buck, or are just a pure waste of time. Even if you have a little crush on a certain travel website you can still use it, and then use Yapta to save money AFTER you purchase. On top of all that the site also allows you to monitor certain airfare costs, and keep your eye on anything that might drop abnormally low. What’s better than jumping on a last minute vacation and saving hundreds? Not much. So What is the Catch with Yapta? As with everything in life there are catches. The thing is that Yapta doesn’t cost a single cent so you do not have much to loss. However, there are some things to keep in mind. If there is a decline in price you have to act quickly to get your credit just in case the price goes back up. (But this rarely happens)Also, in some instances you may be forced to pay a certain airline fee when changing your flight details which can easily cut into your savings. Even still, you really do not have anything to lose. An Average Savings of $300? There are reports online and in certain prestigious publications that claim that Yapta saves its average user $300, but that may be a bit of an exaggeration. All in all, there are a number of people who feel that Yapta is too good to be true, (can’t blame them) and there are faults. But how judgmental or skeptical can you be of a service that is completely free? Try it out. 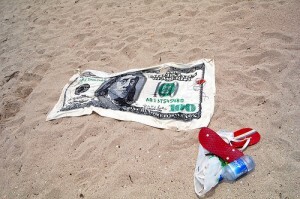 If it works you will be skipping on the beach in no time, knowing that you spent less than everyone else there. If it doesn’t work you can always drown your sorrows with a Margarita on the beach. Just remember to barter with the merchants in the market. You do not need Yapta to save money there. If Yapta works for you be sure to drop us a line, or vice versa. We can save a lot more money on travel together than any one person can alone.